The developers, after a couple of years, finally submitted their environmental report to City Planning. Most everyone expected Planning to sign right off on it and push this project on, and they did exactly that. Now it proceeds to the public hearing process. We think its non-sensical new name ‘apartment hotel’ (that’s an 80/4 ratio of hotel rooms to apartments) may assist this commercial project to elude the Venice Specific Plan’s restriction against tying more than 3 commercial lots together. At this point, only the community can force a more thoughtful project out of the developers. ImagineVenice wrote a few previous articles on this near city-block-long project comprised of an 80 room hotel, 4 apartments and a multitude of restaurants and other hotel services. When the writers first met with the developer years ago, we expressed support for a hotel in principle, and put forth a simple notion, one which more than likely would engender community support for the project — Build Less and Charge More. The developer demurred and said he was going to build to the ‘hotel model.’ One can only assume that this ‘model’ is one which the likes of Starwood, Hilton, or Marriott would find attractive as an acquisition property, ensuring a very big future payday. Our concern is that this hotel being built over 8 lots is designed in such a way that it would negatively affect the nearby residential Oakwood community forever. We think this current scheme comprising more than 50,000 feet, creates ongoing risks to the children of Westminster School. Additionally, we believe that paramount and essential to any good hotel project would be a serious intention to control the truck traffic and car flow it generates. These are important and worrisome issues and they are being glossed over with PR and by various promo ‘meet and greets.’ We doubt there are many pesky neighbors at these ‘outreach’ events to ask the hard questions. There is an intensive PR effort to ‘put lipstick on a pig’! Here is a new flyer with a AKB Petition 04-09-11 for City Council. Your attention is greatly appreciated. Some of you might have already signed this petition- particularly those of you living on Cabrillo. A man named Lenny was coming around collecting signatures. If you already have, please ignore this message. Where we are today regarding this project is the applicant has submitted for permit through the City. Not only are there a lot of holes in the parking design, but our greatest concern is that this new proposed project is significantly different from the original application. Part of the design is the infamous two level car lifts an earshot from residential. We want to put pressure on City Council to make the applicant go through a public hearing so that the public (mostly affected neighbors) have a chance to review the proposed project. If you have time to sign the petition and email and/or fax to Rosendahl’s office (contact provided in petition letter) I would greatly appreciate it. Please make sure you cc me in your email (my fax is 310-943-1745). We need to keep count of letters. Deadline is early next week (or ASAP!). 1) VNC meeting: As an update Weiss was denied being reheard before the VNC this month. His appeal hearing is November 3rd. We will again need letters. It is very important for us to show up to the hearing. Will update you as info arrives. 2) Extended hours for TOR: If you are interested, please send emails on The Other Room hearing (Oct 21st) regarding their request for extended hours. 1p -2a as opposed to 5p-2a. 3) Carlifts: Councilmember Rosendahl sent a letter to the Coastal Commission asking them to revaluate allowing a carlift on AKB. Rosendahl’s Letter to the Commission is attached if you are interested. Thanks for keeping up with all these updates. The neighborhood concern is that AFTERNOON DRINKING will expand an UNWANTED SNYERGY between the proposed 1205 LOCAL and The Other Room. These additional hours will allow TOR to continue to operate without regard for neighborhood concerns. 4. Problems of having a drinking establishment open within a 1000’ of two schools, Elementary and Pre-school. Use the above concerns if you agree, and add your own sentiments of the problems this causes our neighborhood. Remember – keep it short – pull from a past email! Emails needed by OCT 15 to be considered by Planning Commission. Let’s not let this happen. Please read on for update on 1205 Local….. Hearing for Weiss to appeal the denial of his beer and wine license is tentatively Nov 3rd. Your emails will be needed to OPPOSE THE APPEAL again. You can resend the email you sent to the Sept 15th appeal hearing, (which Weiss got postponed to November ) – more on this later. The goal of Weiss’s meeting was to gain support from residents with hopes that he can then get VNC to support his beer and wine license request. Neighbors at meeting did not feel Weiss made substantial concessions. What he suggested is: 1205 could close at 2AM rather than 3AM. He also suggested patio be closed at 11pm, and sidewalk at 9pm. This will not, however, reduce the likely drinking synergy between TOR and 1205. And remember, Weiss is using a grandfathered parking clause. If you think these changes in any way warrant 1205 Local new support by the neighborhood, please email us by Monday 5pm to: (Venice.neighbors.together@gmail.com). Remember: Weiss does not have a reputation for working with residents. The reality is Weiss has already been denied a license by the planning commission. The police and VNC are against Weiss getting a license, and Rosendahl’s office does not support it. While Weiss is pushing for VNC to reverse its opinion prior to his appeal hearing — their decision is already in. Monday night is a meeting to determine if 1205 Local will get on their October 21st agenda again to readdress VNC support. If by chance this happens — we will need to attend that meeting. That’s all for now folks …. We will keep you updated on next steps. Thanks for staying informed on all this! The outcome of 1205 Abbot Kinney Blvd. (AKB), and Craig Weiss’s < The Other Room (TOR) > request for expansion of a new business and beer & wine license is still in our hands. For those who did not attend the 9/23 LUPC (land use & planning) meeting – Weiss was asked to make concessions. He did not budge on hours, number of seats, having outdoor seating or dealing with parking issues… we can only imagine the late night impact on surrounding streets of TOR X 2. The purpose of this email is to give an overview of the public process, and the steps to take to object to Weiss’s requests, and influence the City’s final decision on 1205. Prior to this hearing there are several meetings he must speak before to gain public support for his project. 2) LUPC committee of Venice Neighborhood Council (VNC) (Sept 23rd) àWeiss had about 10 people speak in favor of project which may have swayed LUPC’s recommendations. 3) Upcoming VNC Board (October 20th) Public invited àNeighbors need to show up in force so board knows our issues. LUPC’s recommendation to VNC Board. Of the 5 above requests, the only concession Weiss made was to close outdoor seating prior to 3am. All other requests are pretty much getting a YES vote by LUPC. OCT 2OTH VNC BOARD: The board can choose to go with the LUPC recommendation or make their own. What ever comes out of VNC Board meeting is presented as neighborhood recommendation before zoning and planning hearing. Public can write letters to board and make testimony on 10/20. WHAT NEIGHBORS NEED TO DO NOW! We need to go on public record that we are concerned with Weiss opening another establishment as requested, based on current problems with TOR. 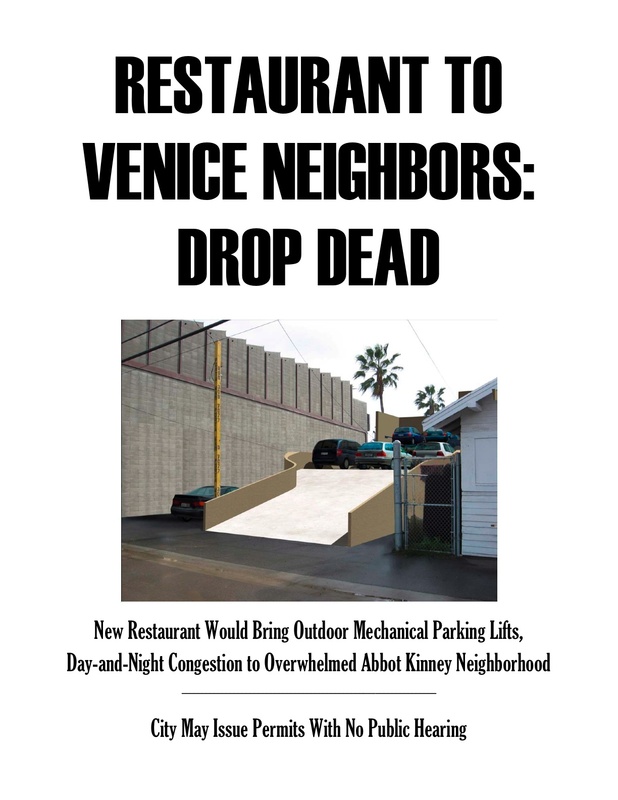 ALSO: Since Rosendahl’s office is dealing with the grandfathered parking — consider telling our councilman (and the VNC board too) we don’t think grandfathered parking is appropriate for Abbot Kinney. historical parking use dating back to 1940s Venice is not relevant to the congestion and impact of AKB on our 21st neighborhood. grandfathered parking clause no longer be used in favor of new restaurant wanting to open on this street. we are also impacted by beach parking – where are the 1205 customers going to park without dedicated parking and 53 seats? too many restaurants on AKB already, and if there is not enough room for the current patrons to park — where will these new ones put there cars? happy letter writing and phone calling…. We can have a real influence by all of us voicing our collective 1205 concerns now! Any questions? Please email us for answers!